Sarasa Vasanthaya - Miyesi Suyamaya (Enthralling Spring - Splendid Musical Span), the Silver Jubilee of the creative journey of popular artiste Nilar N. Cassim will be held on September 7, Friday at 5.30 pm at the Sri Lanka Foundation Institute (SLFI), Colombo 7 under the patronage of President Maithripala Sirisena. A high quality USB Flash Drive containing a compilation of 100 of his songs will be launched during the ceremony. This will be the first launch of such a product in Sri Lanka. A book and CDs containing his lyrics will also be launched, simultaneously. Nilar has composed those songs from the early ’90s up to now. Prof. J. B. Dissanayake, Saman Athauda Hetti and Nadeeka Guruge will speak at the ceremony. Dr. Rohana Weerasinghe will direct the music for the event. Several popular and prominent singers such as, Amarasiri Peiris, Edward Jayakody, Rookantha Gunatilleke, Chandralekha Perera, Uresha Ravihari, Bhathiya Jayakody, Santhush Weeraman, Umaria Singhawansha, Indika Upamali, Kasun Kalhara and many more will sing popular songs at the show. Sri Lanka Rupavahini Corporation (SLRC) is the media sponsor of the ceremony. The event has been organised by the Alumni Association of the Sri Jayawardenepura University. Nilar N. Cassim is the only Sri Lankan Muslim who holds a Sinhala Special Degree (From the University of Sri Jayawardenepura) and a Master’s in Sinhala (from the University of Kelaniya). He has contributed immensely towards the arts and culture of the country. His role in the sphere of literature and lyric writing is significant and widely acclaimed by both, local and foreign scholars and the masses. He has made a name as a reputed Sinhala announcer, a media personality, a lyricist, an author, a translator, a poet and a lecturer. Nilar has won many awards for his literary work, which includes the Bunka Award 2007. He has released three books on lyrics, Pehesara Arunaka (In a bright morning), Kiri Kodu Hithata (Inexperienced/unspoiled mind) and Walakulu Viyan (Awning of clouds) and two classics, Damila Kaviyehi Sri Lankika Salakuna – Jeyapalan (The Sri Lankan mark of Tamil poetry – Jeyapalan), and Asalwesiyage Saahithya (Literature of the neighbour); and authored two children’s books, Demala Hodiya (Tamil alphabet) and Demala Huruwa (Get familiar with Tamil). His works also include three translations, Ardha Daruwa – Demala Ketikatha (Half child – Tamil short stories), Sahodara Piyapath – Demala Kavi (Brotherly wings - Tamil poems) and Kurkhan Kala Sihinaya. He is a prominent script writer and has scripted for popular shows such as, Ridi Reyak, Late Premasiri Kemadasa commemoration show (Handunagaththoth Oba Ma) etc. Nilar was a visiting lecturer at Sripali Mandapaya of the Colombo University; a member of the State Music Panel and a member of the State Literary Panel. 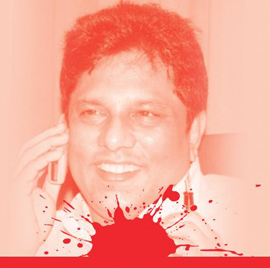 He was a Commissioner of the State Languages Commission; functioned as Director of the Mass Communication Course at Sri Lanka Television Training Institute (SLTTI) and worked as a News Editor for SLRC. Currently, he works as an Executive Officer and Deputy Director (Publicity and Media) at SLRC. According to Nilar, his childhood was spent in Matara. “My parents and relatives are Muslims. My native town is Matara and I did my A/L examination at Rahula Vidyalaya, Matara, before entering Sri Jayawardenapura University. A significant aspect in my life was my parents requesting me to study in the Sinhala medium, when they themselves had studied in the Tamil medium. This paved the way for me to become a communicator who could cross the borders between the Sinhala and Tamil languages, he said. “While in school I engaged in literary work and made contacts with the Ruhunu Sevaya of the SLBC. While at the University, I worked with the print media, and enjoyed contributing to tabloids and magazines, such as, ‘Ravaya’, ‘Yukthiya’ and ‘Vivarana.’ Professors Tissa Kariyawasam, Sunil Ariyaratne and Prof. Balagalle taught me at the University”, Nilar said. “In 1999, my compilation of lyrics ‘Pahasara Arunaka’ was launched, and Prof Sunil Ariyaratne announced at the event. In 2006, the ‘Kiri Kodu Hithata’ mega event was held at the BMICH, in which my lyrics were sung by respective artistes. My passion is in lyric writing, and I realised that my vision could be more freely communicated to a wider audience through songs”, he said. “ I wrote my first song, ‘Samanalun Rodak’ for Malini Bulathsinghala and to date have written around 700 lyrics to many senior artistes as well as to modern day artistes, such as, Bhathiya and Santhush, Centigrade and Ravi Hans. I have catered to their needs with flexibility, with emphasis on the quality of my work. My latest lyric (Ahasin Eha) was for the film ‘Adaraniya Kathavak’. I have written lyrics for many recent Sinhala films”, he said. Nilar especially spoke about reconciliation. “I always keep contact with all communities. I did so from the beginning of my artistic life. I believe, I have a responsibility towards building reconciliation, and my efforts have won recognition. A lyricist or any artiste for that matter has a responsibility towards society. We have no right to fool or mislead our listeners. We have the responsibility to enhance their level of aesthetic appreciation. A song is a slice of our life. It could talk of love, romance, sadness or something else which is embedded to life. A gifted lyricist could indirectly communicate ideas which are food for thought, he added.